If your photos are centered around the people in your life, it makes sense that your photo organization tool should be, too. That's the thinking behind Fotobounce, a free application that helps you organize and securely share your snapshots. Once you download and install Fotobounce, it automatically begins cataloging your photos. You can browse through the photos as it identifies them, but you can't begin using Fotobounce's advanced organization features until all of the photos have been processed. Fotobounce identified more than 14,000 photos on my Windows 7 PC and took about four hours to process all of them. 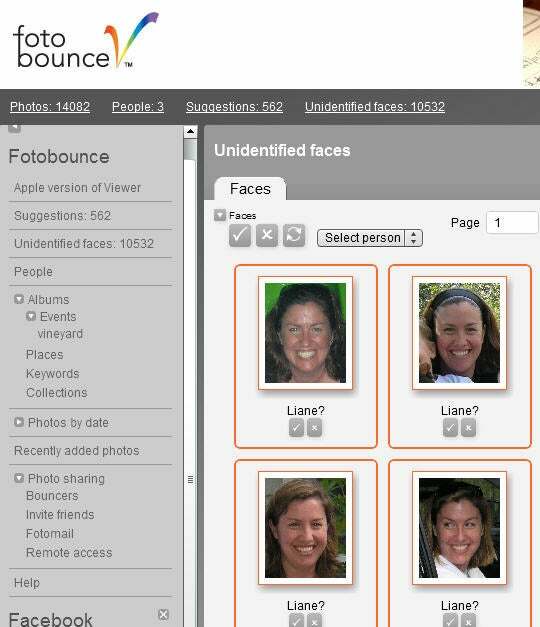 Once you tag a person, Fotobounce learns to identify that face in more photos. Fotobounce organizes your photos in a variety of ways, including by date and by people. Key to this people-centric approach is Fotobounce's face-recognition technology, which is designed to recognize the faces that appear most often in your photos. The company says this recent version (3.7.2) has better face recognition than version 3.1, which I looked at about a year ago. It does seem better. Fotobounce lets you tag people in your photos; as you do so, it learns to identify that person and begins to do so automatically. Luckily Fotobounce doesn't automatically apply tags, as its facial recognition is not 100 percent accurate. Instead, you can choose to accept or reject its suggested tags. In my informal tests, Fotobounce accurately identified faces about 75 to 80 percent of the time; that's a pretty impressive number, and it's much better than its 50 percent success rate in the last version. I found it better at identifying adults than children: When I began tagging my year-old son in some photos, Fotobounce then seemed to identify every baby and toddler I'd ever photographed as him. In some cases, this made sense, as photos of my older children as babies do strongly resemble my youngest son. But in some cases, where the shots were of neighbors and other nonrelatives, the resemblance seemed to center on the age. In addition to people, you can tag photos by location, events, and keywords, which offer useful methods for sorting and viewing photos and albums. But Fotobounce isn't useful only for organizing a large collection of photos; it also offers handy sharing tools. You can use it to post photos and albums to Facebook, Flickr, Google +, and Twitter, and you can set up private peer-to-peer networks for sharing photos directly. To set up a private connection, you send an email invitation; the recipient has to accept and download Fotobounce on their computer. When they do, they can view the photos you share. This is a nice way to share photos privately, but it requires both parties to install Fotobounce, something not everyone wants to do. Fotobounce is free, but ad-supported, which makes it feel more like a cloud-based service than a desktop application. (A $49 license gets you an ad-free version.) So, too, does the fact that it tends to run slowly and screens full of photos can take longer than expected to refresh. Despite these quirks, Fotobounce is entirely desktop-based. Fotobounce offers useful photo organization and sharing tools, and its facial recognition has improved with this latest release. Still, tagging all of the folks in your photos can still take plenty of time--especially if you're working with a large photo library. Combine this with the fact that Fotobounce performs slowly, and that means you might have to devote a good deal of time to using the software. Ad-supported Fotobounce uses face recognition to organize your photo library, and offers sharing tools.